Vancouver, British Columbia--(Newsfile Corp. - January 14, 2019) - ePower Metals Inc. (the "Company" or "ePower") (TSX.V: EPWR) (OTCQB: EPWMF) (FSE: O4V2) reports that the National Forest Service recently disclosed that it was reviewing the Salmon-Challis National Forest (December 20, 2018) for consideration of conversion to Wilderness Area status. In this update the US National Forest Service has concluded that the Blackbird Mountain and Leecock Point areas, (including the Panther Creek Project area), should be excluded from consideration for potential wilderness recommendation for the Salmon-Challis National Forest because of their high mineral potential. "The Salmon-Challis National Forest began forest plan revision in January 2017. In November 2018, a draft wilderness evaluation map was made available for public review that included the Blackbird Mountain and Leecock Point areas. To date, an inventory and evaluation have been conducted in accordance with Forest Service Handbook 1909.12, Chapters 71 and 72, and the forest is receiving comment. A draft record of decision including any wilderness recommendation is expected in 2021. …Further, Executive Order 13817, "A Federal Strategy to Ensure Secure and Reliable Supplies of Critical Minerals" addressed the United States' dependency on vulnerable limited and foreign supply chains of mineral commodities that are vital to the Nation's security and economic prosperity. Cobalt is on that final list of critical minerals." President Michael Collins comments, "We are pleased to see that the US Forest Service recognizes and values the mineral potential of the ePower claims. The decision provides certainty for the development process at Panther Creek and the adjoining eCobalt Solutions project. We look forward to releasing results from the Panther Creek 2018 exploration program." The Panther Creek Cobalt Property comprises 153 unpatented lode mining claims (~3,060 acres, ~1238 hectares) and two patented mining claims (41.3 acres, 16.7 hectares) located in the heart of the Idaho Cobalt Belt. ePower has earned a 50% interest in the property and has the right to earn up to a 100% interest. The Panther Creek Cobalt Project adjoins eCobalt Solutions Inc.'s Idaho Cobalt Project (Ram deposit), the only advanced stage, near-term, environmentally permitted, primary cobalt project in the United States, and the historic Blackbird Cobalt-Copper Mine in Lemhi County, Idaho. There are several historic mine workings on the property. Channel sampling by US Geological Survey at the Little Deer Creek Prospect returned 1.04% cobalt and 4.14% copper across 10 feet or 3.0 metres, and a dump grab sample from the historic workings at the Sweet Repose Adit assayed 0.46% cobalt and 0.27% copper (US Geol. Survey, Open File Report 98-478). The Long Dike Prospect, which are on the patented claims, has not been sampled but reportedly has several adits and at least 500 feet (152 metres) of underground workings. The cobalt-copper mineralization is hosted in the micaceous quartzites of the Apple Creek Formation which is a similar geological setting as the historic Blackbird Mine as well as eCobalt's Ram deposit. *The grades and descriptions stated in the USGS reports and by Utah Mineral Resources LLC have not been verified by the Company, and readers are cautioned not to place undue weight on such results. The historical grades are considered relevant; however, the reliability, assumptions, parameters and methods used in preparing the reports are unknown. 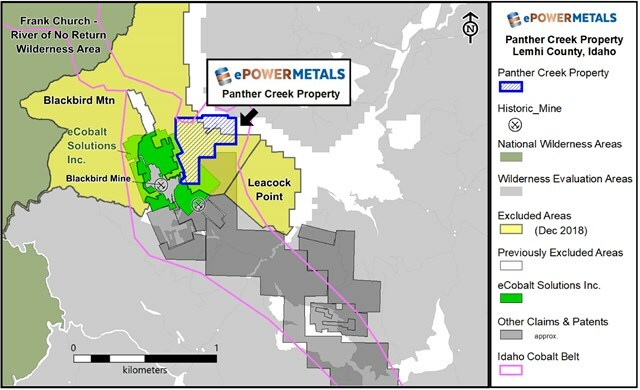 ePower Metals Inc. is committed to creating significant shareholder value by advancing a high-quality portfolio of metals for the future - cobalt, copper and manganese - that the company believes are undervalued, strategically positioned and have significant potential to provide future supply to the growing rechargeable battery industry. With core projects in Mexico, Idaho and Suriname, ePower is well placed to develop significant cobalt resources in in the face of tightly constrained cobalt market supply. Bruce Kienlen, P.Geo., VP Exploration, is the Qualified Person for the Panther Creek Project.